Mr. Beam's Living Room Concept Makes It Easy To Test Out A New Decor With Projectors | OhGizmo! By Andrew Liszewski on 02/17/11 • Leave a comment! Mr. Beam (Mo Assem & Ruben van Esterik) is a small company based out of the Netherlands that specializes in giant lighting installations that use powerful video projectors to map graphics and animations over large buildings. But they’ve recently taken their expertise indoors with their fun Living Room concept. Using only 2 projectors and some extremely careful planning and mapping, they’re able to project an entire 360° decor onto a living room filled with white furniture. This includes projected wallpaper and even carpeting. 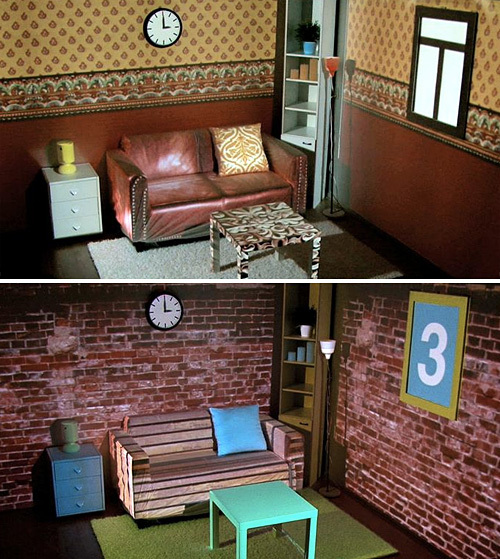 The concept, which is not unlike Michel Gondry’s Dead Leaves And The Dirty Ground video for The White Stripes (RIP) could make it really easy for interior decorators to try out an infinite number of pattern and color combinations before committing to a new decor in a room. That is if Mr. Beam ever decides to commercialize it.